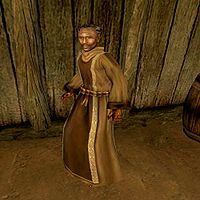 Hinald is a Redguard pawnbroker and Wet Ear of the Thieves Guild. He works at the Druegh-jigger's Rest in Gnaar Mok, where he has a small selection of assorted goods for sale. This page was last modified on 25 October 2014, at 17:24.